Being too young to talk, little Ludwig gestured, helplessly. Edelstahl, Seile, Holz, Stahlfedern, etc. Provinz stammender, tauber und stummer Handwerker den Bau dieser Maschine. und gespreizten Metallfedern, welche eine dynamische Verbindung zwischen der oberen Sitz-Konstruktion und der unteren Bodenkonstrution herstellen. Nehmen auf dieser zentralen Plattform Menschen Platz, und bewegen sich diese auch nur minimal, so werden diese Bewegungen durch die Konstruktion dynamisiert, es entstehen Schaukel- und Wippbewegungen. Durch ein System von Schnüren sind 4 Tische mit dieser Konstrution verbunden. Sie umgeben das Zentrum in einer symetrischen Form. Die Tische hängen in der Luft, sie hängen an den Schnüren, diese sind über Deckenaufhängungen mit der zentralen Konstruktion verbunden. 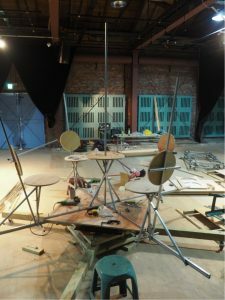 Jede Schnur führt von einem Tisch über die Aufhängung zur zentralen Installation, dort durch eine Öse weiterüber die nächste Deckenaufhängung zum nächsten Tisch. So sind alle Tische untereinander, sowie auch mit der zentralen Konstruktion verbunden, es entsteht ein komplexes Wechselspiel der Kräfte zwischen den einzeleln Elementen. nem Ende. So werden die Bewegungen des Systems permanent an 4 verschiedenen Orten in graphische Notationen übersetzt. 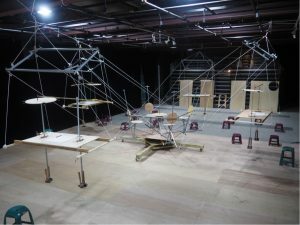 In this case the contemplators, the exhibition’s visitors, are invited to act as a co-producer, in fact turning into a part of the object, a functional link of the overall system. 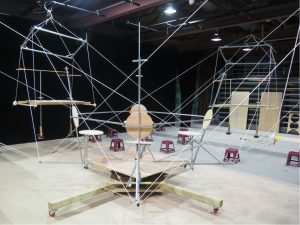 Four chairs and a round table are bedded upon steel- spring system, which allows for the dynamic sampling of the body’s movements ascribed to the persosn sitting down. Several ropes transmit this kind of information to four tables, situated vis-à-vis. 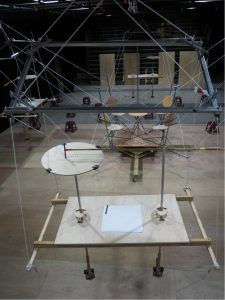 Each table has been expanded with two corresponding pendulums: the first pendulum is attached to an arm with pen; the second provides drawing paper on top of a wooden plate. The vibrations of the pendulums meet exactly at the moment when the tip of the pen touches the surface of the paper. This spot of the drawing process is the system’s final and starting point at the same time. 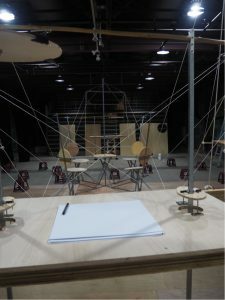 The movement triggered by pendulums, table and hanger assembly in return passes on kinetic energy to the person on the stool. The internal motion of the system therefore stimulates the pulse transmitter (person) with retrospective effect. The visitor’s actions put the apparatus into operation, the process seems to be assessable, yet human supervision increasingly slips away. 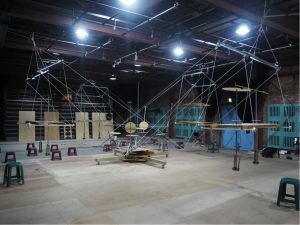 “Action” and “agitation” turn into “stimulus” and “reaction”, arbitrary muscular efforts trigger involuntary movements. What is mapped to the paper in the end? Does the person functioning as the trigger contact try to image something or hasn’t the pulser rather become the image? Is it still possible to construe on the assumption of dualist principles like concept/image, reality/image or objective/abstract considering the setting of the apparatus? In what sense is the architecture of the medium’s construction responsible for differing appearances of the visual outcome?